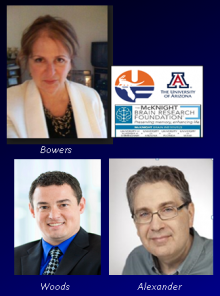 Dr. Bowers and her colleagues at UF (Dr. Adam Woods) and U. Arizona (Dr. Gene Alexander) will be piloting a novel, low cost intervention for improving cognition (memory, executive function) in healthy older adults experiencing normal age-related changes. The intervention involves transcranial and intranasal delivery of low level light (near infrared) over an 8-week period. This is a blinded sham-controlled RCT targeting cognitive, mood, and neuroimaging outcomes (MRS Spectroscopy, resting state fMRI). Participants will be run across both sites. The presumed mechanism of change underlying photobiomodulation, based on animal studies, is improved mitochondrial function via ATP and increased blood flow. This study will be the first to examine mechanism of change in humans.